The Nexus 6P may have a design flaw in which the glass protecting the rear-facing camera breaks easily. 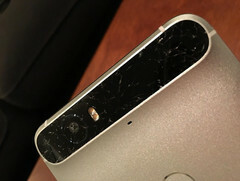 Although Google has been touting the quality of the camera on the Nexus 6P, it seems as though some users are already running into problems regarding the glass that protects the rear-facing camera. Some users have been reporting for the past day or so that the glass protecting the camera has been breaking spontaneously. Reports of this have surfaced on Reddit and Twitter, and users are experiencing this problem just a day after receiving their new device. Fortunately for these users experiencing the problem, Google will replace or repair the devices for free as it is a design issue rather than the result of accidental damage. Some sites are positing that the glass cracking is due to setting the smartphone on a cool surface like granite or marble. Seeing as glass expands in heat and shrinks while on cool surfaces, this could be due to the glass shrinking too quickly upon being placed on a cool table or other surfaces below room temperature. Google has yet to respond formally to this issue, and it is still unclear if the present issue is in fact due to hardware issues rather than a few users accidentally dropping and damaging the 6P. If this is truly a widespread flaw that afflicts a lot of the smartphones, then Google and Huawei will most likely have to make some changes to stop this from happening, while repairing those who are affected.